Spring is so inspiring, so welcoming, so delightful... It never ceases to amaze me how almost imperceptibly the pink shades of cherry and apple blossoms are being replaced by the pretty purple-violet color of the lilac trees. It's like nature reminds us that there is always beauty and "good" if we choose to see it. Lilacs give softness to the world and to life. I love it, not only for its enchanting fragrance but mostly because of its delicacy and humbleness. The story, according to Greek mythology, begins with a stunning nymph named Syringa (lilac's botanical name) who caught the eye of Pan, the god of fields and forests. Captivated by her beauty, Pan chased Syringa through the forest until she became exhausted. To escape Pan, the nymph turned herself into a fragrant flowering bush - the flower we today refer to as lilac. I am obsessed! 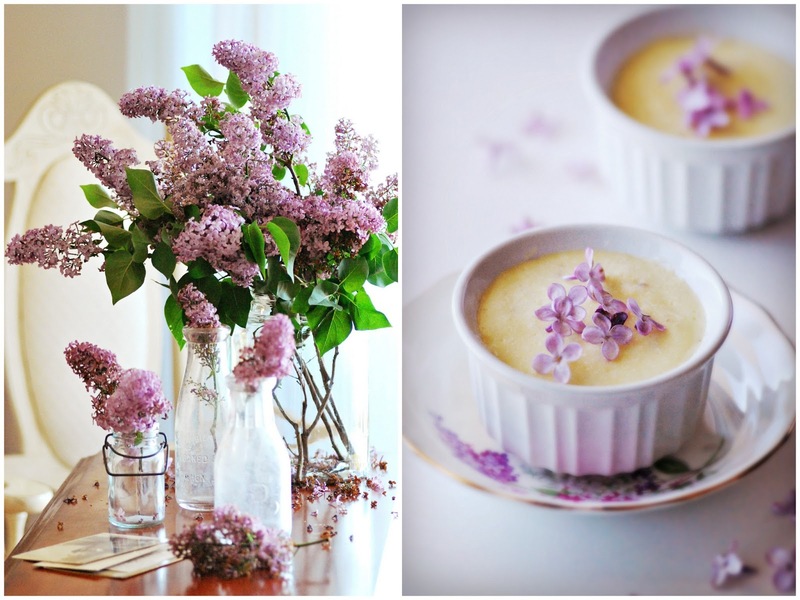 The idea that I can cook with lilacs is totally inspiring to me. 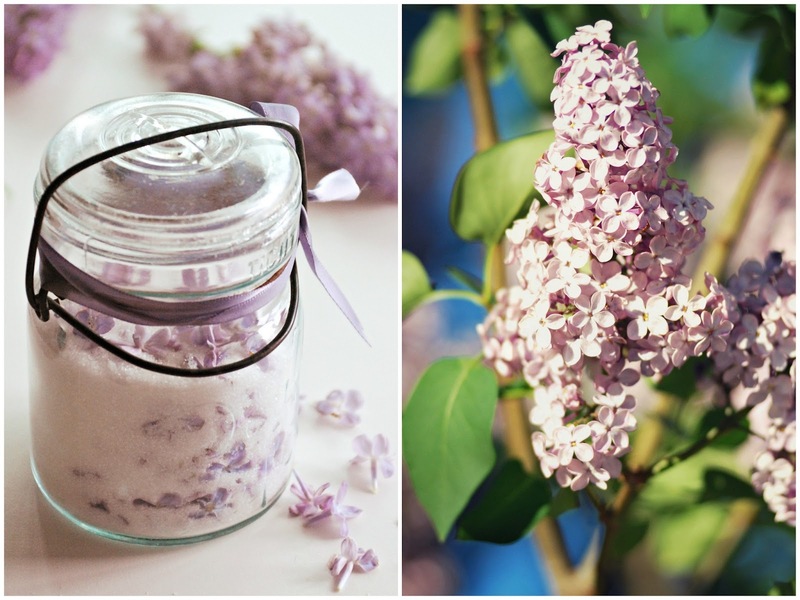 Knowing that lilacs do not last long, I took advantage of the blooming yard-grown unsprayed shrubs in the garden and using the classic vanilla cream recipe from my mom's journal, I made lilac-infused cream. I used lilac sugar, which is really simple to make, and for the milk, I put milk and lilac petals in a jar and refrigerated overnight. Lilacs make a great sorbet, jam, jelly, muffins, syrup, candied lilacs... Cleaning and harvesting the tiny blossoms is time-consuming, but also enjoyable. The fresh, sweet and slightly bitter taste of the flower creates a very intriguing, beautiful and pleasant dish on every table. They say you are what you eat, right? So, why not, be ... a lilac ... for a while?! 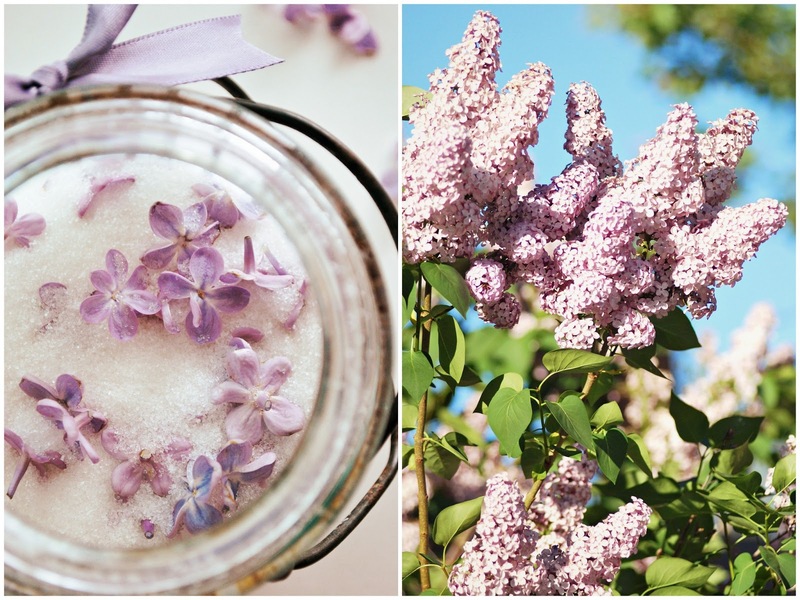 Make layers with lilac flowers and sugar in the jar. Put on the lid, shake the jar, and place it on a shelf in a cool, dark place. Shake it every now and then over the next days. The sugar will be ready to use in 1-2 weeks. Perfect for baking, in a cup of tea or coffee, or simply as a gift. Wow I did not know that lilacs were edible!Oh but there scent is heavenly <3 Yours are beautiful! Lovely photography that makes me want to walk through the photo into your world! You are setting me up for the perfect morning. I am just about to take a walk in our lovely neighborhood, where many lilac trees are in full bloom. We had a late start this year on spring, but that's fine with me; we are able to extend the joy. Edible flowers are a joy. I love using lavender (herbes de Provence) on my pizza sauce! The tea is also perfect for those sleepless nights and just the thought of biting into a little violet in a salad makes me feel that much closer to nature. I am loving your photos! This is just gorgeous! Thank you so much for joining Home Sweet Home! I will feature you on next week's HSH! OH MY GOOODNESS! So beautiful! I didn't know that lilacs were edible. I'm making this sugar next year for sure!!!! 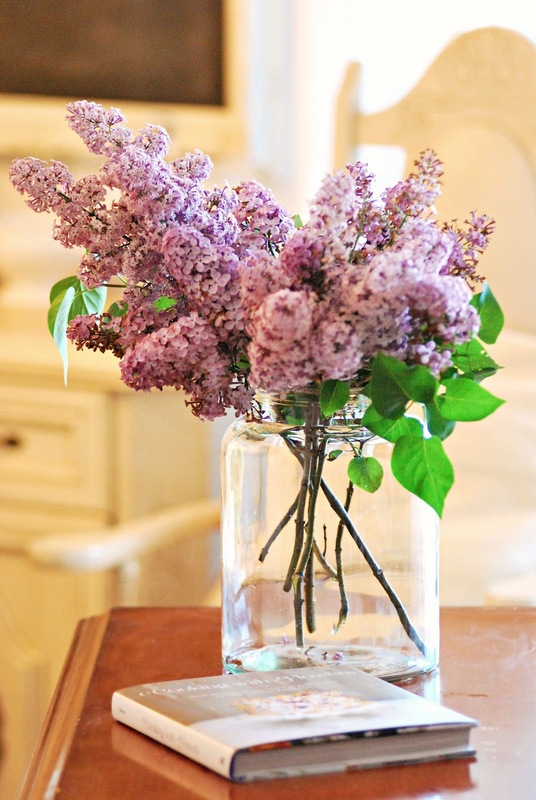 Thanks for sharing at TUTORIALS TIPS AND TIDBITS with your great sweet smelling ideas for lilacs! What a beautiful and informative post! I knew about a few edible flowers, but I didn't know about lilacs. The cream looks delicious! Thanks for the tips and book recommendation. Love this post and your photos. I know so little about lilacs and don't know that I have ever seen a plant, but I have been reading so many posts about lilacs, that I know I must go in search. I loved the little history lesson. I absolutely love lilacs! We lived in Florida for over 40 years and lilacs don't grow there. We moved to the mountains of North Carolina a few years ago and I saw a lilac bush and picked a big bouquet of them. I was literally in tears I was so happy to have some, I actually carried them from room to room with me. 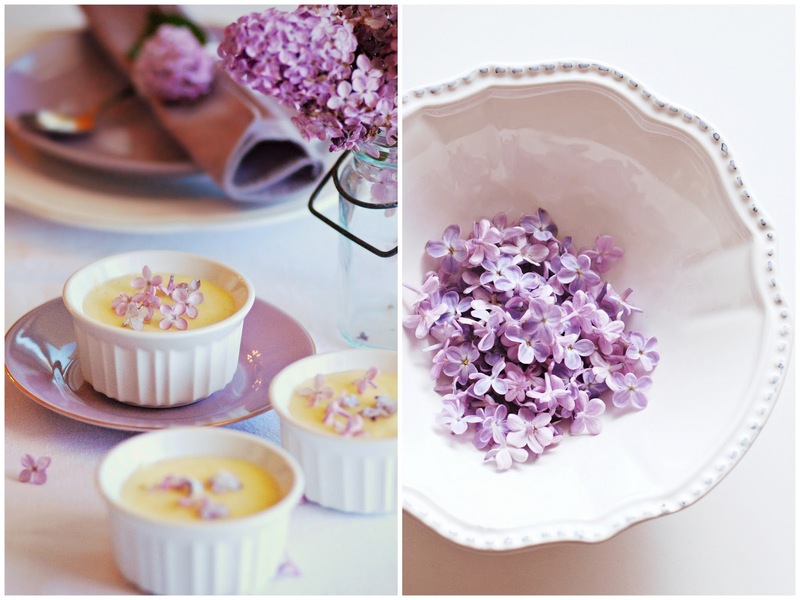 Thank you for your glorious photos and lilac sugar recipe! Enchanting photographs Sylvia! What a touch of lilac can do! Gorgeous photos! Lilacs are a favorite of mine too, I adore the smell! They remind me of my grandmother as they lined her walkway...always think of her when they bloom. 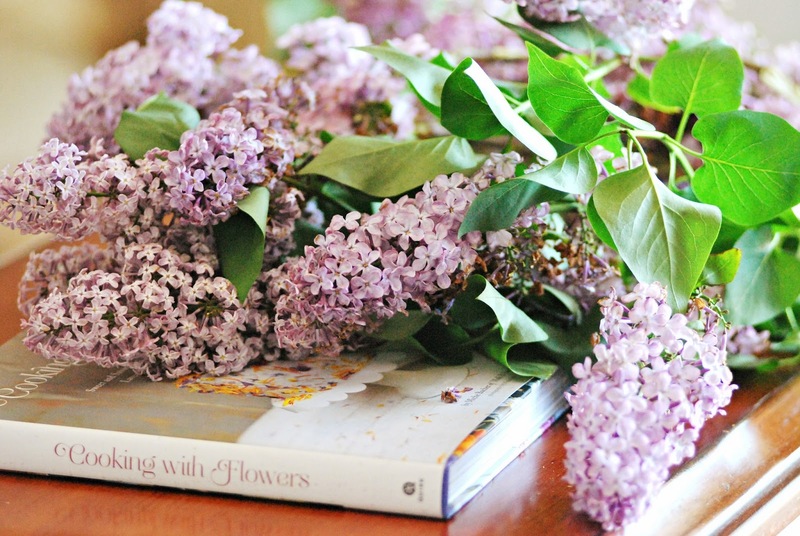 Gorgeous Slyvia~ I adore that cookbook and wish we could grow lilacs here! Lilacs are my FAVORITE flowers! Sadly, our spring was really cold, and there weren't many blooming this year. I have no idea what they would taste like, what a fun idea! And your pictures are positively breathtaking. Love!! Lilacs bring back so many happy childhood memories for me. You're photographs are simply, beautiful! I never knew that lilacs were edible! I'll have to remember that next spring. Thanks, Sylvia! It's a shame that my lilacs are now finished, but that means that the peonies have begun. What gorgeous images you create!